Online Safety is about Behaviour, it is informed use of Devices, Sites, Apps & Gaming & Online Behaviour that makes for a Safe Online Environment. Social Media, Apps & Gaming is nothing to be afraid of. 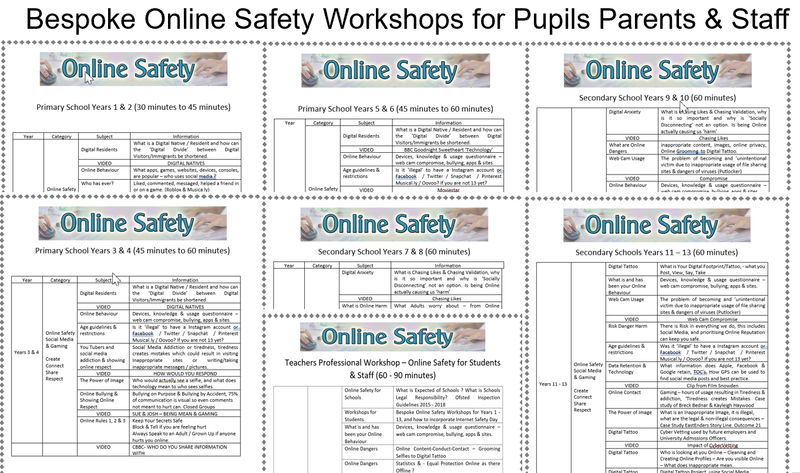 Online Safety within Safeguarding is now certainly very much ‘stand alone’ and requires specific training / workshops for the Whole School, staff, pupils & parents, supplied by qualified, experienced and competent experts who continue to research the area of Online Safety and Online behaviour. Online Safety is also of paramount importance, irrespective of country, as all children, teenagers and young adults use devices, social media / apps / gaming, which can have a massive impact on their future goals and targets (ie CyberVetting for Employment & Universities). Online Safety is about behaviour and understanding the difference between appropriate and inappropriate online behaviour to avoid becoming an intended or unintended victim of online exploitation (Bullying / Grooming / Radicalisation / Reputational Damage / Hacking / Data Abuse / Webcam Compromise / Cyber Vetting Issues). Without a doubt, the vast majority of your students – at least those in Years 5 – 13 – have social media accounts. Many teachers are also on social media both for personal and professional use and, for the most part, that’s great. From a professional standpoint it can enhance your network of contacts, engage you in important discussions, extend your own learning and even provide a platform for class projects. As for personal use, well, teachers have lives, families, friends and interests just like everyone else so, naturally, many are drawn to social networking as a way to connect to the people they care about. I have worked extensively in International Schools in Europe, Middle East and Far East Asia and I have a deep knowledge of the technological context in which international schools work and therefore have a unique insight into international schools specific context and always tailor my approach accordingly (no other Online safety supplier provides such expertise in this bespoke setting). I always focus on the practical application of Online safety & Social Media Training that is up to date, current & relevant; and explore the wide range of Online Behaviour and most current ‘Online Safety message’, not simply standard, ad-hoc ‘Online Safety’ Advise. 2. The description of three areas of exploitation – bullying, grooming and radicalisation, and highlight what other forms of online exploitation exist. 3. Importance of understanding the use of Social Media in relation to a child’s and young adults Online Behaviour. Inspire parents to support and take greater interest in the online behaviours at home that place our children at greater risk and make them more vulnerable to harm by leading a Family Learning Programme.